Q-BA-MAZE 2.0 Bounce Stunts make marbles spring into action. 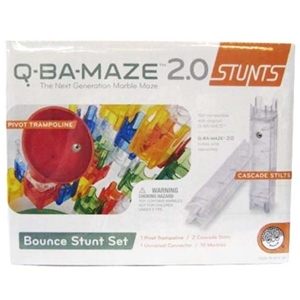 The precision engineered Pivot Trampoline and Cascade Stilts combine with Q-BA-MAZE 2.0 cubes (sold separately) to create surprising marble stunts that inspire hours of creative play. Ages 6 and up. Not compatible with the original Q-BA MAZE.